Is there any trick to know new Japanese words I have never heard before? 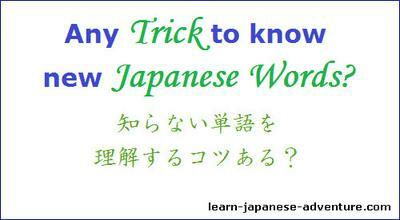 Any Trick to know new Japanese Words? But one question still gets me, say I started a conversation with a person and he started using words that I've never heard before. Is there any way I would be able to tell what he's talking about or should I just learn a lot more words in Japanese? Because I'm carefully paying attention to what I do but I understand there're way too many Japanese words and I already got the language named down so I can figure it out if I have too. One of my friends was telling me that even masters of Japanese don't understand every Japanese word out there but they can still talk to each other so I guess what I'm saying is - Is there a trick to figuring out new words that someone brings up in a conversation without having to actually look it up? Personally I don't think there's any trick to be able to know new Japanese words which you've never heard before. Although I don't deny that you can sometimes guess the meanings of unknown words in a conversation, it's not always the case. Most of the times your guess will be incorrect. In my opinion, in order to have some ability to guess words that you don't know in a conversation, you must at least have some in-depth understanding of that language. I am referring to people who have learned that language for at least five years, or at least are learning at the advanced level. I am not saying that you can't do that if you are a beginner. But unless you're a language genius, it's rare that you can guess unknown words correctly. I have to admit that until today, I still have difficulties understanding every word spoken by the natives in a Japanese drama. And the best way that I'll do is to consult my Japanese electronic dictionary, or visit some online Japanese dictionary sites. I always think that the more words or vocabulary that you know, the more confident you'll become at learning a language. The more that you learn the language, the more you'll aware that you have to increase your knowledge of more vocabulary. This process will keep repeating until you're really good at that language. However, even you have mastered that language, there're always words that are unknown to you. You may be good at guessing their meanings now at this level. But it's still wise to check out their real and exact meanings from a dictionary because even if you can guess their general meanings, there'll be some subtle differences that you won't know unless you check the dictionary. Having said that, I think different people have different ways of learning Japanese or a new language. There may be some people who are capable to know new words that they've never heard before. Comments for Is there any trick to know new Japanese words I have never heard before? In a conversation you have the ability to query the other person and have a dialogue back and forth to try to ensure your understanding. Even in your native language you can find some superflous(<--- see!) examples of words that are not necessary or can be replaced with other similar or synonymous words. The actual nuance of a particular word is probably the more notable point for using it in a given situation. I think that is probably often an experience thing based on how natives use the term in context.